Just Can’t Get Enough – Another Post On Earth’s Mightiest Heroes! “It’s almost time! I’m not going to enjoy conducting this Membership Review – but I really have no choice! I’m the leader of this outfit! It’s my job – my responsibility to make the Avengers the most effective fighting force possible!” – Captain America. First of all, apologies for the yawning gap since my last Post, but really, how do you follow Thanos?! Seriously though, that Review fell flat; none of the fiction is working; and the less said about that hi-brow essay on transdimensional engineering the better… sheesh! My writing reached such a low point that over the four-day Easter weekend, my creative faculties switched instead to sketching. Might as well have carried on with all that incessant partying throughout the week following my birthday if one knew how lousy the upkeep of this blog would turn out! 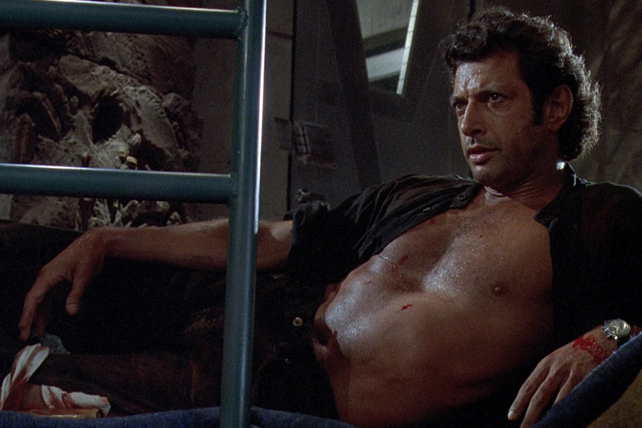 Nothing else can explain how – over this past few weeks – half a dozen posts were worked on before being discarded, falling unbelievably weeeell below the usual Bradtastic standard you have come to expect here. Even this little concoction – an easy-peasy piece that should only have taken a few hours to compile – ended up in development-hell for several days; where oh where can you get the stamina these days…?! Anyways, will spare you the torrid tales of mishaps and miseries. Just reckoned it best to escape into the myriad majesties of Marveldom. “It’s some sort of unearthly inhuman vision-! 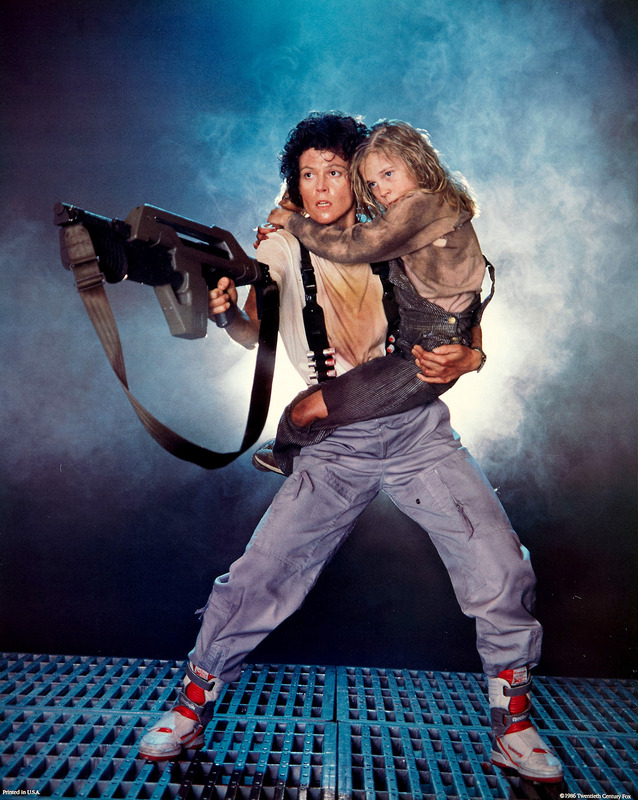 And that voice… like something from beyond the grave…!” – Wasp. 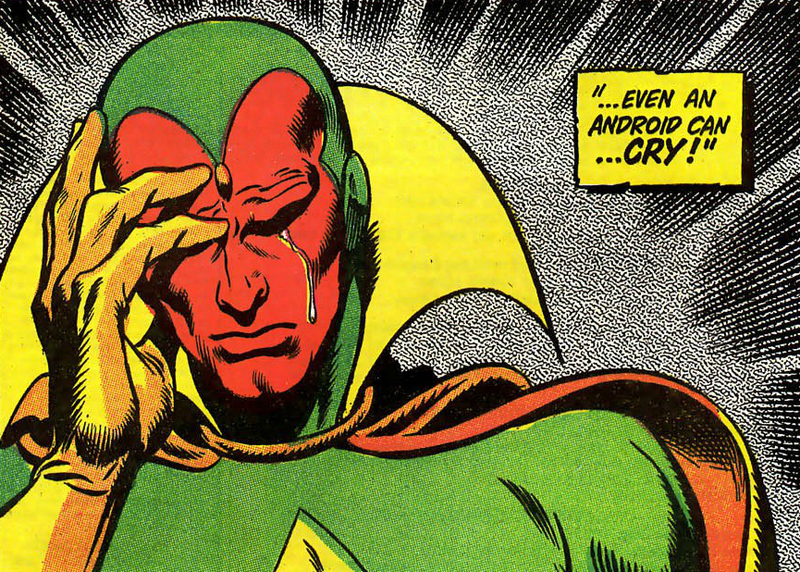 Ever since catching sight of that supercool yellow and green fella on the cover of Marvel UK’s first issue of Marvel Superheroes (September 1979) The Vision has been my favourite Avenger. 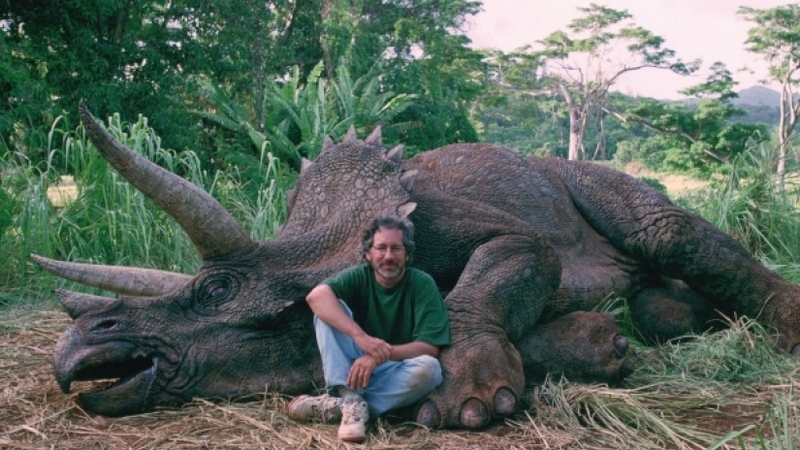 Naturally, the tale of his origins became much sought after. 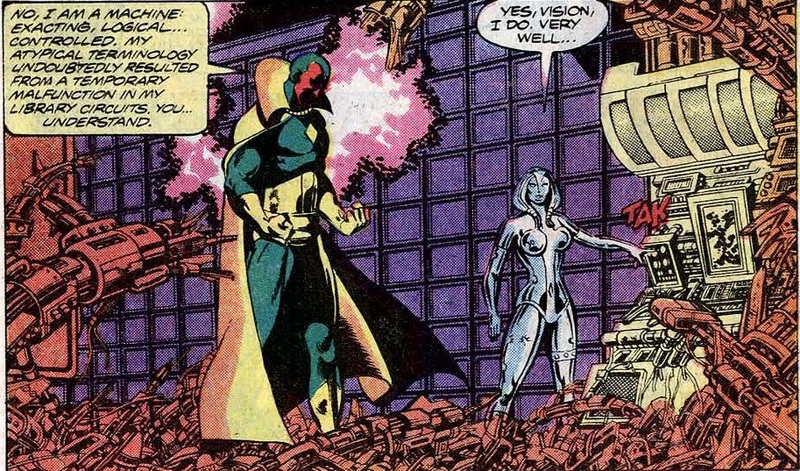 This synthozoid made his debut in The Avengers #57 “Behold… The Vision!” (October 1968) – a veritable star-studded super-saga! As these Silver Age ishs are so hard to come by – especially at affordable rates – the ultracheap Marvel UK reprints make suitable alternatives. The Avengers Weekly #84-85 (April-May 1975) carries this epic. This story also featured Hank Pym in one of his most decisive roles as he fought his errant creation, that classic antagonist: Ultron. Written by the irrepressible Roy Thomas, this ish turned out to be a John Buscema masterclass. “The Grey Gargoyle turned my armor into stone, but not the man inside it. Other than a heck of an itch on my nose, I’m as good as new. DD and I’ll be fine… so long as Central Park’s pigeon population doesn’t find us!” – Iron Man. 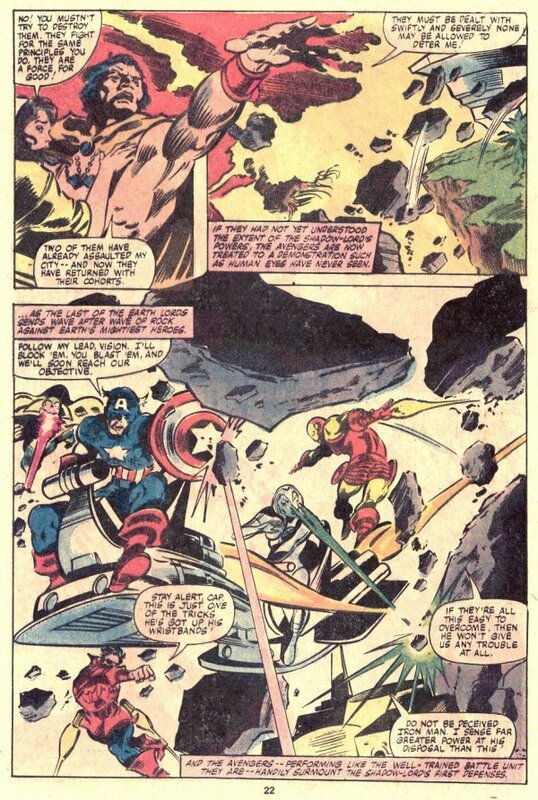 The Avengers: drawn by John Byrne?! Indeed, The Avengers #191 (January 1980) – written by then-regular scripter: David Michelinie – proves to be an irresistible ish. Iron Man and Daredevil have been turned to stone by the Grey Gargoyle, who has wrought havoc in downtown Manhattan; he fights The Avengers and WINS! He returns to his old apartment, to collect chemicals to augment his powers, only to discover that the new tenant has thrown them out! Thank goodness The Falcon turns up to battle the wrath of the Gargoyle, holding him off until the regrouped Avengers can show up. Scarlet Witch uses her hex power to turn him back into flesh and blood. And the title of this Bronze Age extravaganza? “Hah! 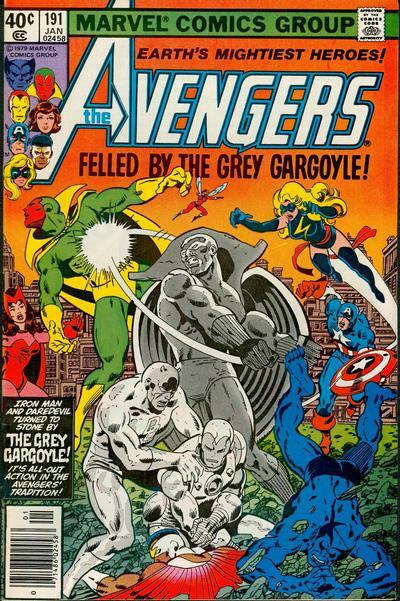 It’s at times like this that I wonder how people can call you the Earth’s Mightiest Heroes!” – The Grey Gargoyle. 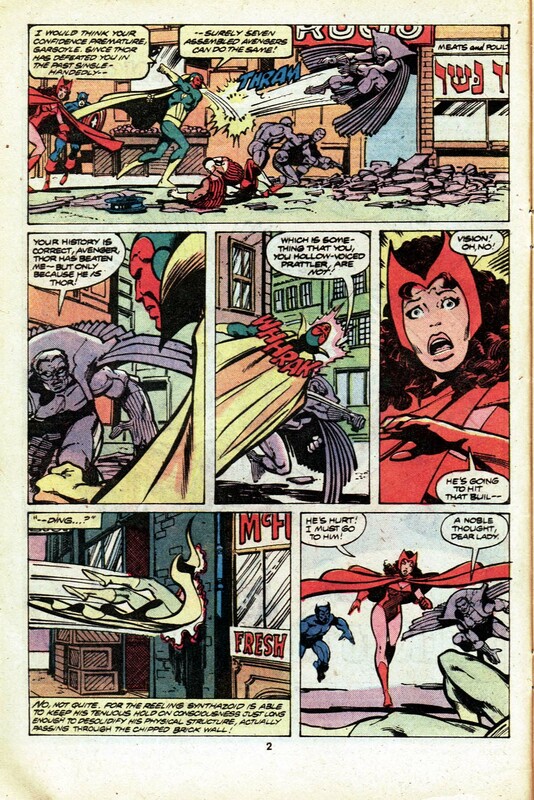 The Avengers #194 “Interlude!” (April 1980) makes it into this survey ‘cos of George Perez’s art. 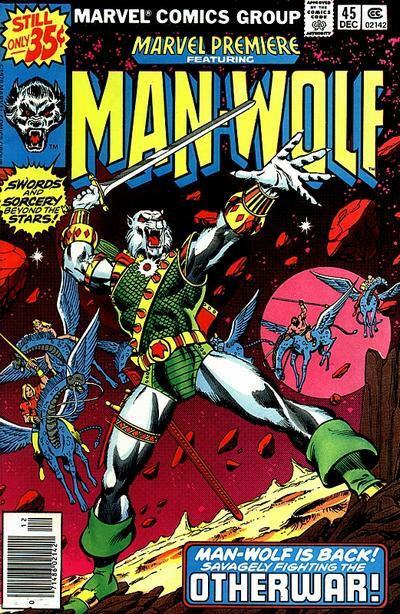 Having done such an impressive job on Man-Wolf, a stint on this series sounded too cool to miss! Just before an official meeting, a frightened and dishevelled man named Selbe turns up at Avengers Mansion pleading for protection. Shady officials arrive, claiming the man has escaped from the “Solomon Institute for the Criminally Insane,” so have to turn him over. And, yes yes yes, it’s another showcase to present The Vision’s extraordinary powers. That double spread on pages 12-13 is quite stupendous. “They didn’t even notice me… didn’t count me! Was it an oversight? Or had everyone already made up their minds that I would be one of those eliminated…? I am nothing to them! They do not want me here!” – Jocasta. “Bah! That the Son of Odin must so proclaim himself-! Are there no heralds about? Nay… never when thou needest one! Still, I wonder… if chosen to remain will I choose to do so?” – Thor. 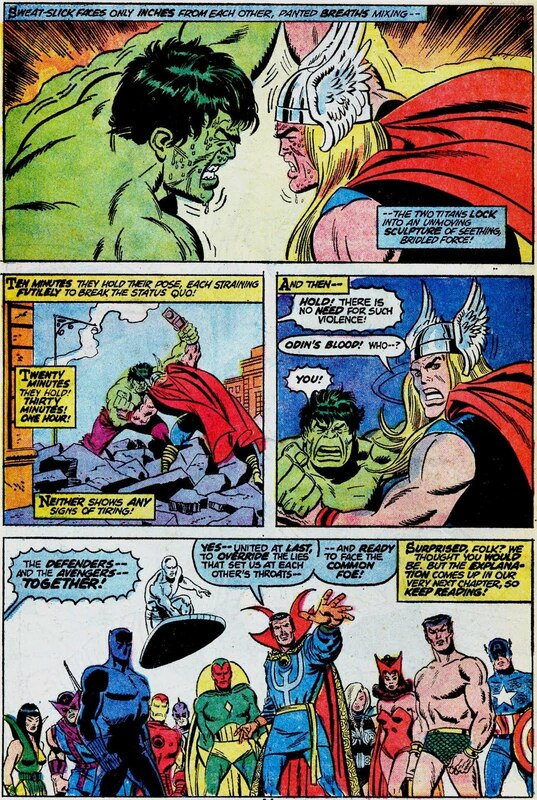 The Avengers #211 “…By Force Of Mind!” (September 1981) is integral to this survey. Originally picked up @ a Comics Fair in 1990, this happened to be my very first Avengers ish. Moreover, it marks my introduction to the astonishing artistic talent that was Gene Colan. Now, it does not contain a particularly dramatic story – it is, however, the ish in which the Cap decrees that there can only be SIX members on the team, not eight. 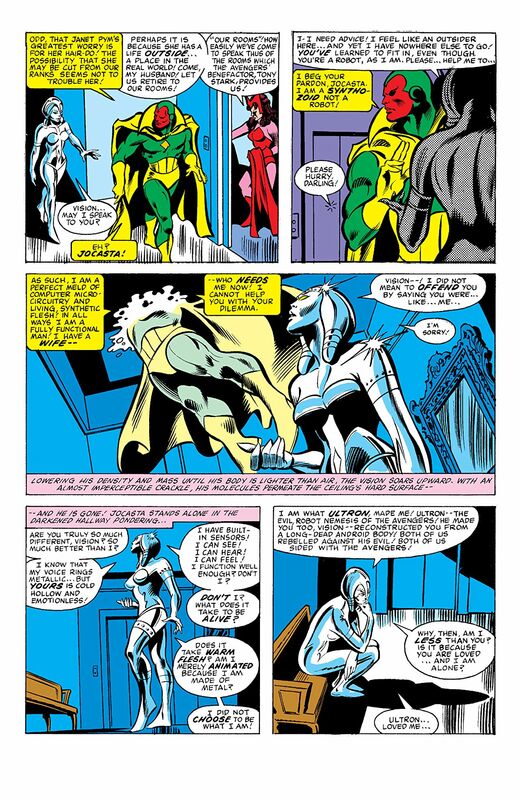 There are guest-stars aplenty: Hawkeye, Black Widow, Moon Knight, Dazzler, Iceman, Tigra et al, all brought to the Avengers Mansion at the dodgy hypnotic instigation of Moondragon, to test their suitability to join. Thus, The Vision and his wife: The Scarlet Witch decide to leave the Mansion; even The Beast and Wonder Man decided to call it quits! “…I’m leaving! Wondy and I had a talk this morning… You know, I used to be a scientist! I used to habe a future besides my next gag and tomorrow night’s date! I want to see if there’s anything left of Hank McCoy besides a “blue-furred buffoon”!” – The Beast. “I remembered that a human being can survive for a few seconds in the vacuum of space, so I turned physical… and cut loose with my power blast! The reaction force sent me flying backward… but I managed to regain light form, just as the torpedo slammed into another orbital generator!” – Captain Marvel. “Understand, our once-proud empire now lies in shambles. Several of your months ago, the world devourer Galactus came to the imperial throneworld. “And on the heels of this shocking news, chaos and rebellion spread throughout the galaxy. “Amid this insanity rose a great mercenary army. Its warriors were outcasts of a thousand worlds from this galaxy and others. And its leader is a she-demon who calls herself Nebula. Look at that cover! 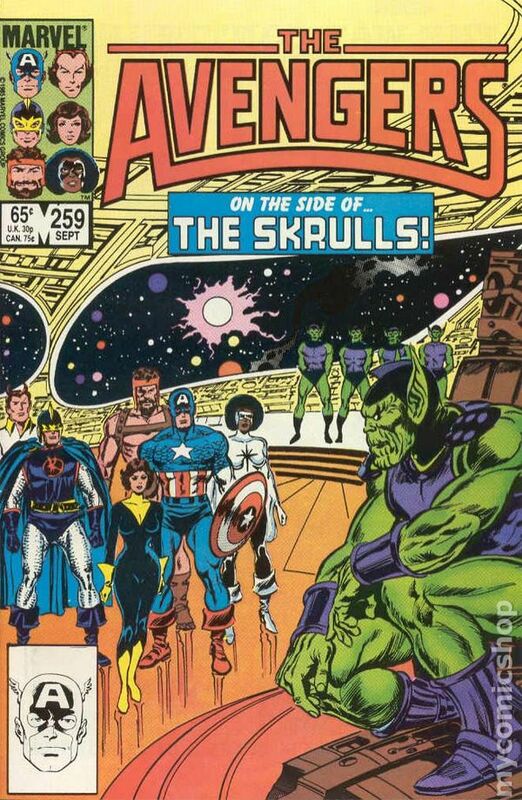 “On the side of… the Skrulls!”? Nevertheless, this startling cover did direct me to one of the most stiking ishs of John Buscema’s second classic stint on this series. 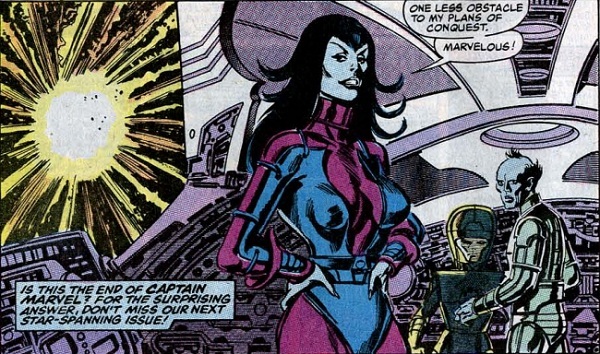 “Duty Over All” (Septamber 1985) continues the Earth’s Mightiest Heroes – in this case: the Cap, Wasp, Captain Marvel, Hercules, the Black Knight and Starfox – opposition to Nebula: treacherous she-devil daughter of dreaded Thanos – only introduced in ish #257. She poses such a gargantuan threat to the galaxy that Earth’s Mightiest Heroes must band together with their sworn enemies: the Skrulls – yes! The Skrulls! Even Firelord couldn’t believe/accept that monstrous fact either!! This list may yet change as other classic ishs permeate the Bradscribe Collection. But come ON, friends! This Post has been completed. And Published! “No one tells me what I “must” do…! Have all stations made battle-ready! And make certain that everyone knows… we will take no prisoners!” – Nebula. Because You Demanded It! Brad Gets Lost! But In Which Realm…? Oh, don’t mind the mess. On this stormy night, your tour guide here is busy supervising his rabble of minions to sort out the multifarious All-Colour delights that have accumulated over this past year. So, what theme for this particular Bronze Age Bonanza? During these (dark) times, when most of us would just like to escape, plunging into pulsating pages of fantasy seem the most reassuring answer – why not escape with Brad? Another scintillating variety show has been assembled; mocha and cake await. Fasten your seatbelts – the awesomeness has been set in an upright position. Asgard! And – hey! – Olympia too?! “Thou wouldst hurl skyfire at him who did direct the forging of his son’s own storming-bringing hammer?! Verily, such effrontery doth cry out unto the heavens for punishment!” – Odin All-Father. 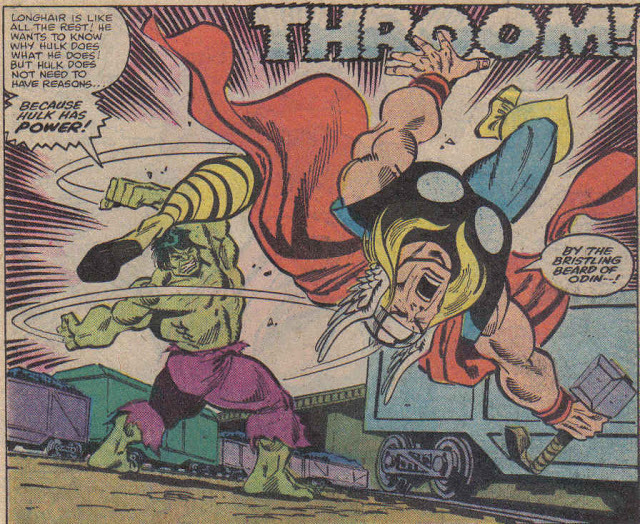 with that legendary run by Big John Buscema especially topping mt shopping list. 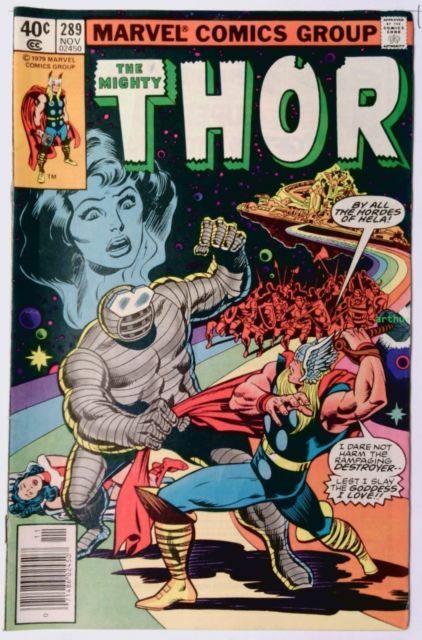 The Mighty Thor is one of my most beloved series; thus, now, more than ever, my scanners have been reprogrammed to seek out anything and everything Asgardian, especially as Thor: Ragnarok-fever gathers apace. 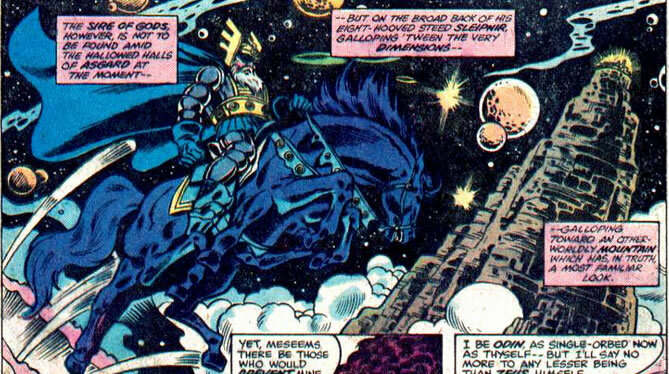 In The Mighty Thor #289 (November 1979) “Look Homeward, Asgardian!” – brought to us by the ever-reliable pen of Roy Thomas, and the ever-exquisite pencils of Keith Pollard – Thor, after seeing his father kneeling before the Celestials, angrily hurls himself at the One Above All. Instead of striking him, he is instantly transported into Olympia. Zuras tells Thor that he has 24 hours to find another solution to the Celestials predicament, before the Uni-Mind will attack. Meanwhile, back in Asgard, Karnilla weeps over the body of Balder, then speaks to Frigga about her not being Thor’s real mother. Jeez! This is a cosmic soap opera! “I’ve had enough! 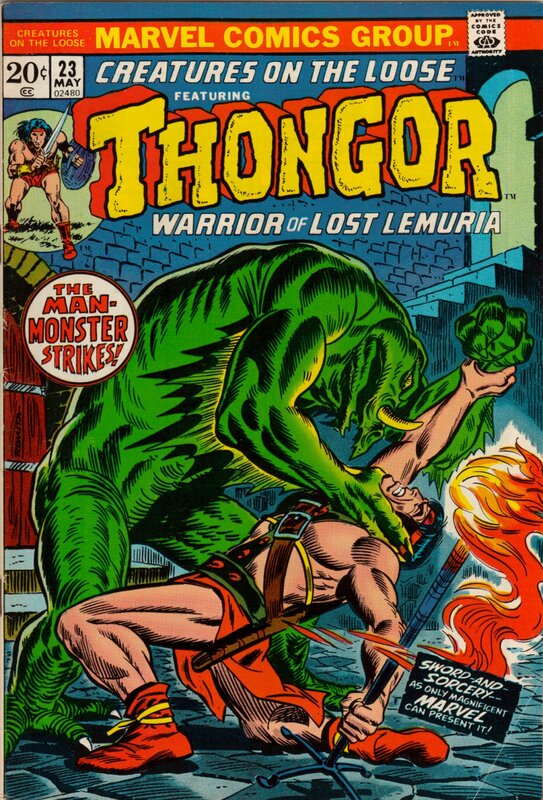 There is still time before the wizard Athmar Phong returns at dawn… I will not be in his power!” – Thongor. Sadly, this is the only clever line you will find in this section. It has been an absolute joy catching up with Man-Wolf – one of the more intriguing characters to initially spark this craving for classic Bronze Age comics. Unfortunatey, the series carrying his adventures: Creatures On The Loose was cancelled, with two episodes of the Star-God epic failing to see the light of day. …than have to sit through another ish in this series. – so explains the confused captain of a US aircrafl carrier who encounters an otherworldly city: the Shadow Realm, reappearing in the ocean two millennia after it mysteriously vanished. In 1981, this series consisted of critically-panned fillers, However, during this period, Genial Gene “The Dean” Colan contributed his legendary art. 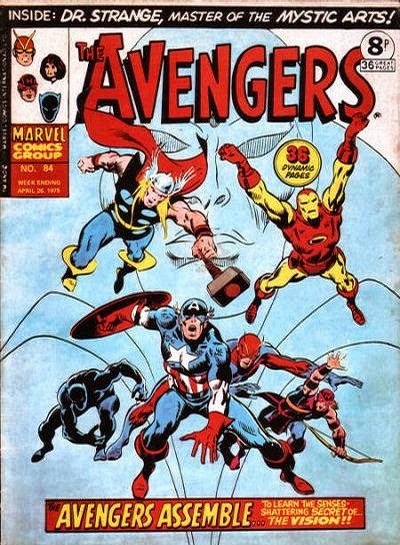 Glad to say that the monumental ish: #211 – in which “Earth’s Mightiest Heroes” were trimmed from eight members down to a combo of six – happened to be my very first Avengers mag! Twenty years later, it is equally thrilling to have tracked down #207 (May 1981); “Beyond A Shadow…” is an astounding tale of science-fantasy. Fortunately, already in Italy is my comedic-double-act-of-the-moment: Wonder-Man (making a spaghetti western) and The Beast (working on his tan and letting the local signorinas stroke his blue fur and what-not). 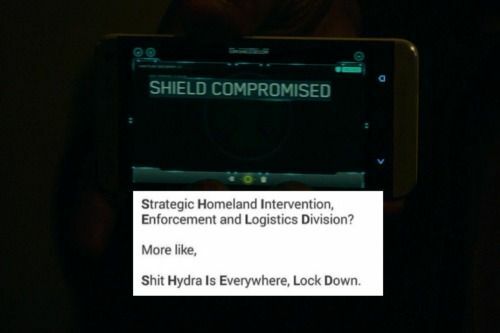 Pretty soon, all the Avengers are on the scene. 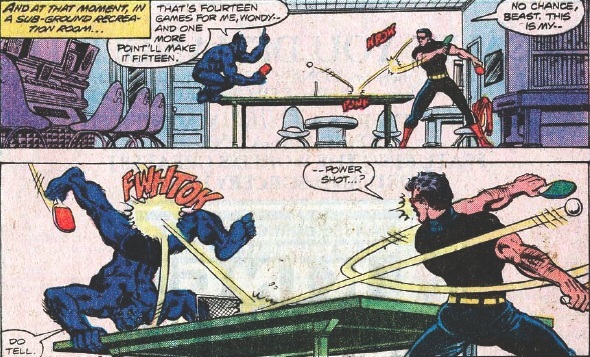 In a touching interlude (spread out across four wonderful pages) Shadow-Lord tells Wonder-Man’s girlfriend that he is a member of an ancient tribe who “gradually learned to control certain forces of nature.” Feared and shunned by others, they – and their powers – withdrew into the obscurity of history. Sheesh, there’s always one, isn’t there?! 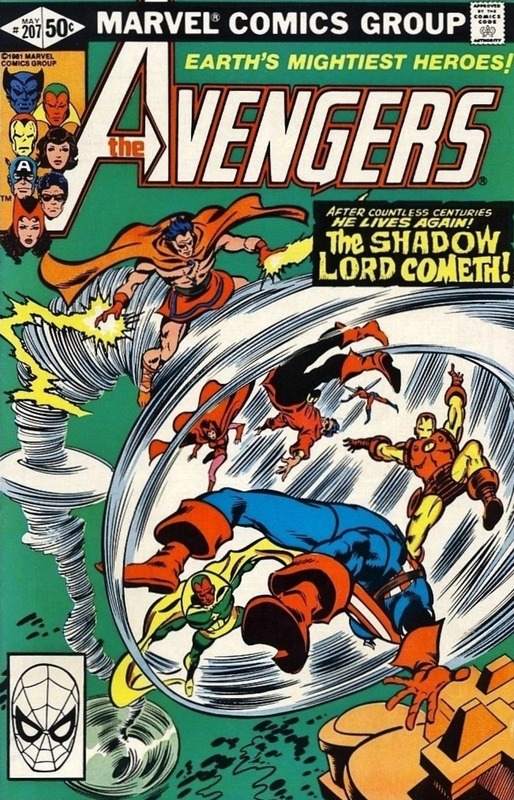 Such a tragic end: the Avengers are too late to realise that Shadow-Lord was just a Guardian; the real threat (the one he gave up mortality – and his love – to thwart) comes in the form of The Berserker: that immortal force who – having already conquered the world once in the guise of an ancient Roman emperor – no doubt proves his formidable villainry in the much-sought-after #208! “The slightest touch of my realm dispels life within you! The sizeable rock which smote the other spirit dispatched it almost instantly, as you saw! Even now, the submicroscopic particles always present in space cut through you…” – Death. One of the undeniable pleasures to be gained from this hunt for yesteryears’ awesomeness is catching up with Doctor Strange. 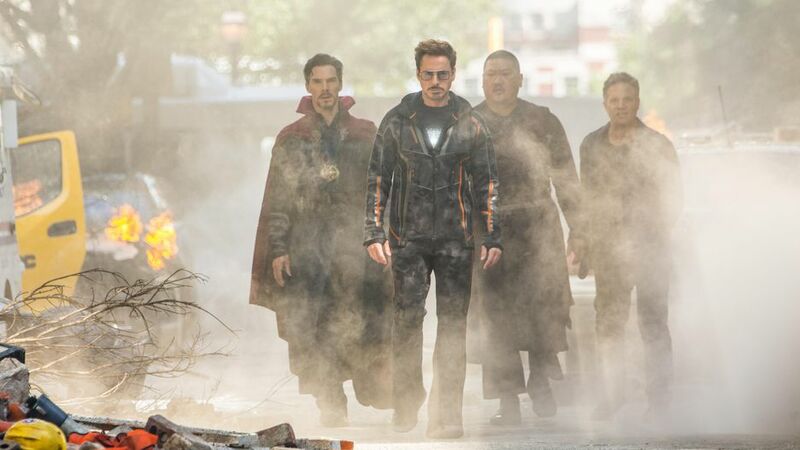 Last year – to prepare myself for Bennybatch’s dip into the MCU – getting acquainted with the Master Of Th Mystic Arts seemed like the obvious – and somewhat tantalising – treat. Talk about getting MORE than you bargained for! Steve Englehart’s scripts are a revelation, and – yes! – the realism evoked by Gene “The Dean” Colan’s pencils is just as magical as anything The Master Of Mystic Arts can conjure. Blimey! Never a dull moment with Stephen! In my restless pursuit of Bronze Age comics, who knew that a descent into the horrific Realm Of Death could make for such an engrossing read? 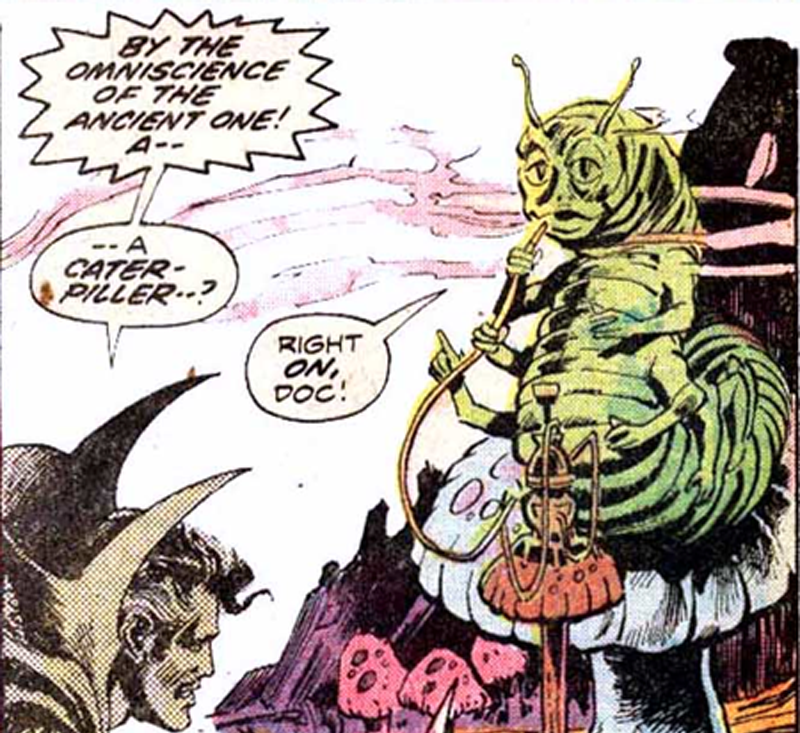 It is amazing how swiftly Doctor Strange has become one of my fave characters in all o’ Marveldom, and – Oshtur be praised! – this ish is a veritable classic, and would grace anybody’s collection (if you can lay your hands on it). “…For Galactus has said before, and shall say again, that Galactus is supreme unto himself! Galactus is Galactus! That is all any lesser being ever need know!” – (guess who? 😉 ) Galactus. Regular Followers will know the squidgy and sentimental soft spot that Brad holds for ROM: Th Greatest of the Spaceknights, celebrated in this Post. 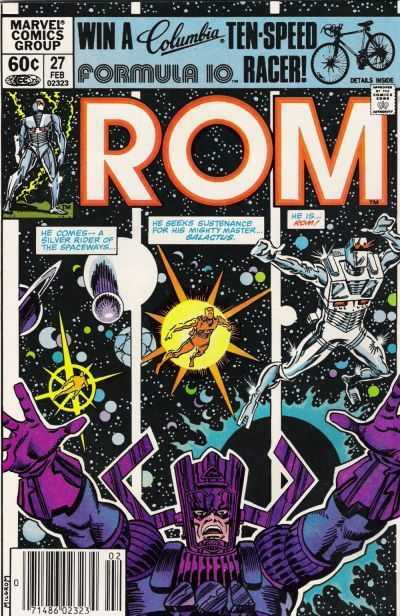 The Marvel Milestone recognised as #25 witnessed ROM’s dramatic return to his beloved homeworld. AND is one of the single most amazing ishs to ever pass through these grubby mitts. 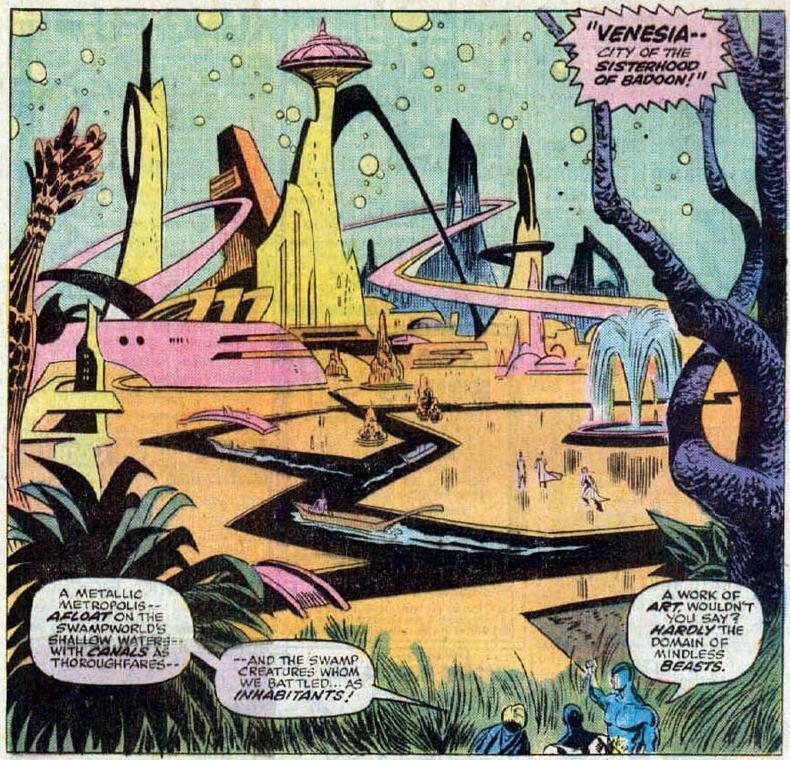 But nothing prepared this blogger for what would transpire in #26 – GALACTUS – YES! GALACTUS, the gargantuan World-Devourer – through his despicable herald: Terrax The Tamer, announces that Galador itself has whetted his dreaded appetite! Thus, the Spaceknights assemble to enact one of the Bronze Age’s most epic battles. Yet it is the extraordinarily impressive #27 (February 1982) that tickles MY taste buds here. Delivered by the consistently-impressive dynamic duo of Bill Mantlo and Sal Buscema: “Turnabout is Fair Play!” witnesses th deal that ROM has made: taking the Devourer of Worlds to the Dark Nebula, and thus rid the Spaceknights of the homeworld of their sworn enemy: the Dire Wraiths. Wraithworld is unlike any planet Galactus has ever had to deal with before! “Rivers of molten metal scar the surface… Ash as black as night sweeps like a pestilence through the darkling sky!” he complains bitterly. Not surprisingly, this ish holds a reserved place in my collection. “Yes! Leap at me, carrion! Come be kissed by my shining hand!” – Duna. Aha! THIS is more like it! The concluding instalment (in Marvel Premiere Featuring Man-Wolf #46) is equally awesome. 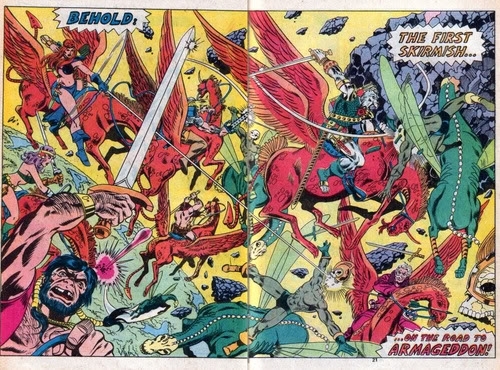 Just seeing Wolfie and his otherdimensional buddies on (flying) horseback jousting in mid-air with the cadaverous horde of Arisen Tyrk is perfect to while away any rainy day. 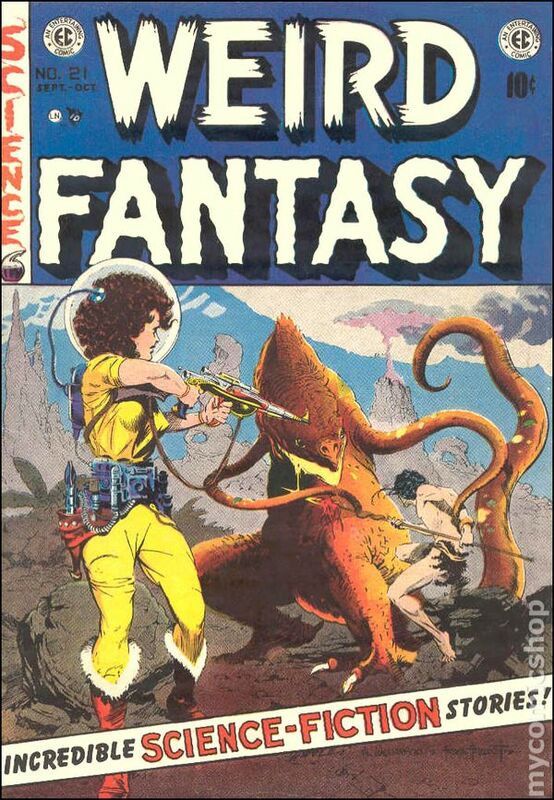 This sums up – in the most groovy manner possible – what Bronze Age comics could deliver at the height of their creative powers. Mesmerizingly illustrated, this ish not only provides a swell escape from my daily toils and troubles, but inspires me to conjure up my own weird and wonderful worlds. On that positive note, here ends this Bronze Age Bonanza! “You crummy skeletons think you can pick us off that easily? Eat my fire, bonebags!” – Gorjoon. So much has happened since Brad last saw you! Firstly, last week proved exceedingly exhausting – both physically and mentally. Writing has been so-so: reasonably good stuff, but not to my “usual” mind-blowing standards – been writing my wrongs, so to speak – ha! Actually, my creative output in the meantime has concentrated on my artwork – some extraordinary prelims and portraits produced; need to find the most effective means to publish them online! Okay, so fart and furious fanboy here is a HUGE Thor fan – thus, naturally he believes this IS going to be one of the best Marvel Studios blockbusters ever. Looking at it calmly from a neutral perspective… BY THE BRISTLING BEARD OF ODIN!! ‘Tis STILL going to be a Winner!! It will see the God of Thunder team-up with the Green Goliath. Incidentally, this is a pipping pairing that one could never have envisaged back in the day, nor has it emerged this past year during my valiant pursuit of Bronze Age comics. And yet this couple of hotheaded fools look like they could be a winning combination. Also, we are assured of a cameo from Bennybatch as Doctor Strange! Never has the old saying: “The more the merrier” been so apt! But this is in keeping with the spirit of sharing and co-operation that abounds in the original comics. This Post offers just a mere fraction of the degrees of collaboration to be discovered around the Marvel Comics Universe. Come and enjoy the ride, fellow Marvelites! 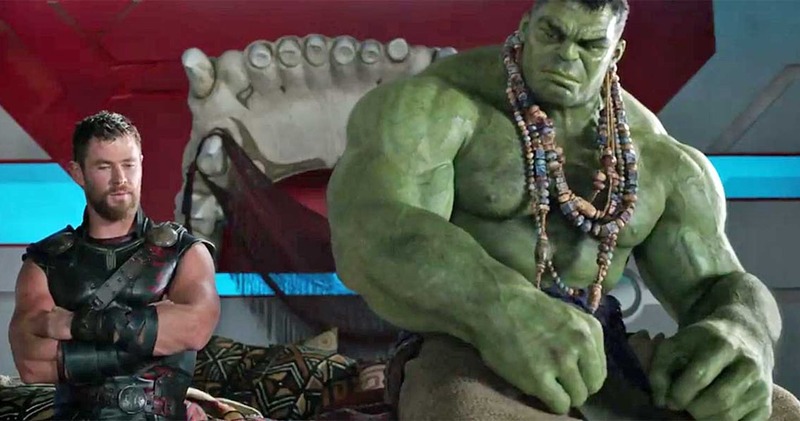 “Yes, Hulk was Avenger once… Didn’t like it…” – Hulk. 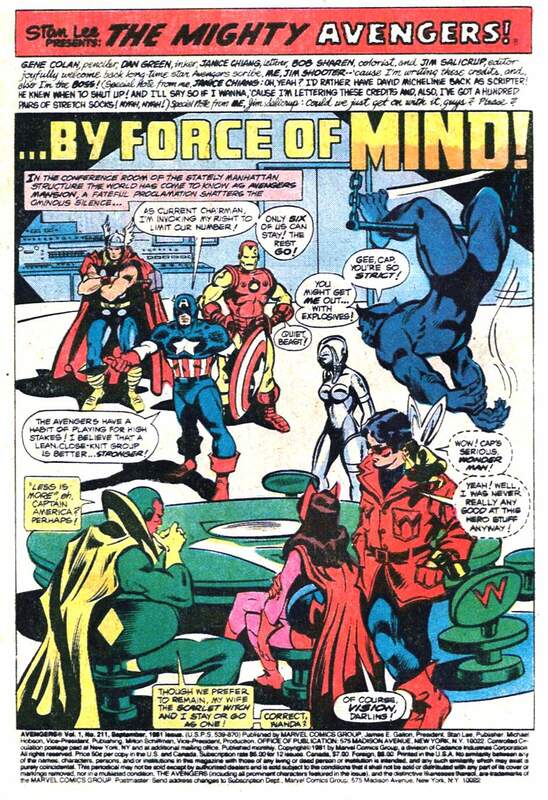 In Defenders #10 (November 1973) The Avengers Vs. The Defenders Chapter 9: Breakthrough! The Incredible Hulk Vs. The Mighty Thor, both Hulk and Thor have arrived in Los Angeles, determined to find the Evil Eye. 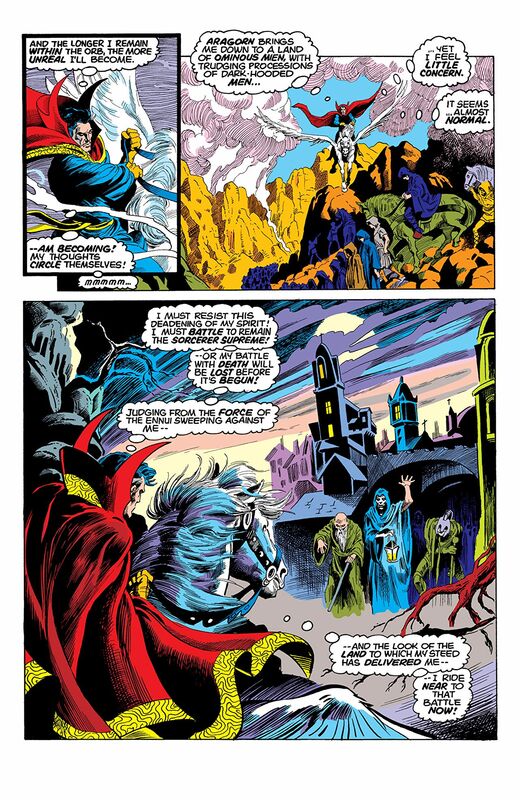 This signals the arrival of Dormammu: one of Dr. Strange’s demon foes. Only the intervention of both afore-mentioned combined super-ensembles could break them apart! Just before these details could be frantically jotted onto my shopping list, so it didn’t come as any surprise to learn that this ish is ultra-rare – going for ridiculous three-figure prices on e-bay. We couldn’t finish this particular segment without a mighty THROOM! Earlier this month, in the surprisingly very entertaining Spider-Man: Homecoming, we were treated to the goofy Queens teen getting the mentor-treatment from Tony Stark/Iron Man. Undeniably, Spidey is Marvel Comics’ most iconic figure, albeit one that admittedly never chewed up my pocket money. Deluged by sequels and reboots in recent times, it is now hard to imagine that the eternally youthful webslinger had to begin somewhere. And so it was, the very first ish of Spider-Man (March 1963), the young webhead received supporting turns from the well-established Fantastic Four. A great way to get acquainted with as many Marvel characters as poss – particularly upholding that Marvel spirit of collaboration –involves Spidey‘s second regular series: Marvel Team-Up (commencing in 1969), in which he was accompanied by a different Special Guest Star in each ish. Marvel Team-Up #9 (May 1973) The Tomorrow War! features Spidey’s first and most memorable collaboration with the Armored Avenger. Never a dull moment at Avengers Mansion! 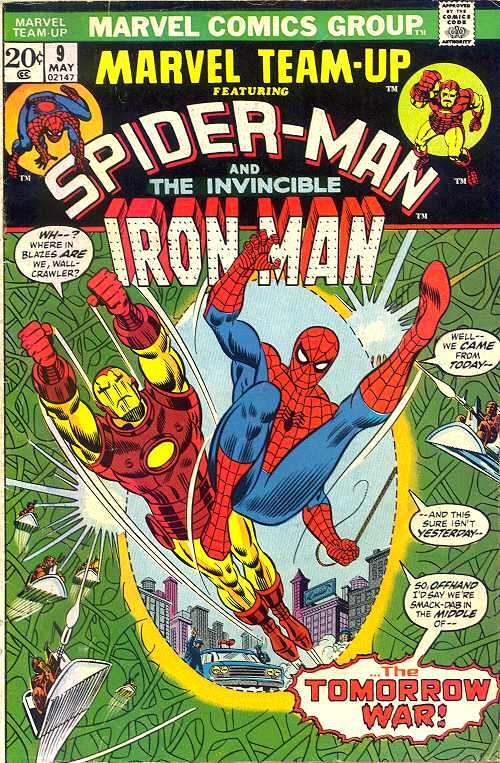 When the awesome abode is enveloped in a mysterious energy barrier, both Iron Man and Spider-Man go to investigate. After unsuccessful attempts to breach the barrier, a portal appears and the two heroes travel into it. Finding themselves transported to the 23rd Century, the two battle all manner of futuristic weapons. With the aid of Zarrko, the Tomorrow Man, they have to fight off Kang the Conquerer: a regular Silver Age Avengers foe. Isn’t it marvellous 😉 how some of Marvel’s best ishs could emerge from the most unlikely sources? 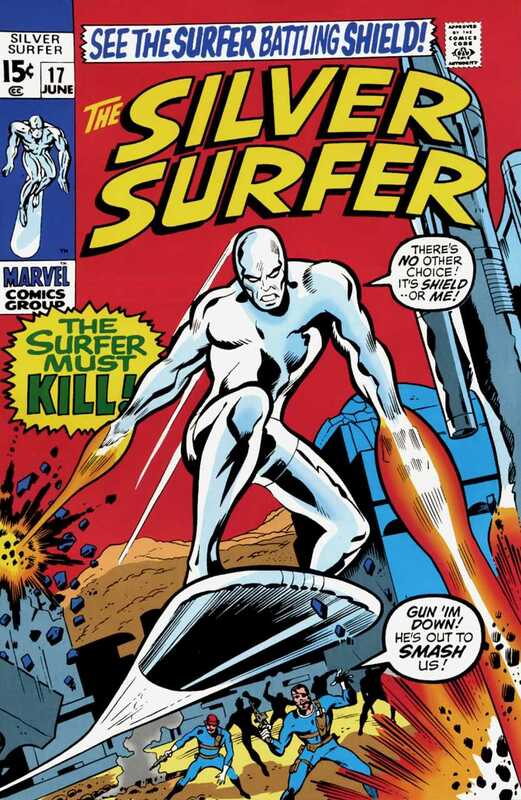 Even when Brad was, oh, about that high, The Silver Surfer held zero appeal: no groovy costume. And: zooming through the cosmos on a surfboard? Even when you’re SIX, that concept sounds/looks bloomin’ bonkers. Put that concept to the indomitable creative duo of Stan Lee and John Buscema = the thrill-power intensifies! In #17 (November 1973), willed by Mephisto to destroy S.H.I.E.L.D., the Surfer has to confront Nick Fury, but along the way there are enjoyable cameos from Tony Stark and the Fantastic Four. Having vowed never to harm humans, the Surfer’s reluctance to engage in combat convinces the Earthbound heroes that a higher force is at work; thus, a truce is established which thoroughly dischuffs Mephisto no end! A random rummage through my own Bronze Age comic collection soon presents an example where multifarious members of Marveldom united to see off an alien threat (in, you know, that hub of extraterrestrial entanglements: downtown Manhattan). ROM #23 (October 1981), sees the Galadorian Spaceknight himself regarded as the threat(!) Having convinced two local enhanced individuals that the real menace exists in the malevolent, shapeshifting forms of the Dire Wraiths, (in Power Man and Iron Fist #73 – reviewed here) the terrific trio have to convince Reed Richards, the security system @ Baxter Building (the F4’s HQ) – not to mention the National Guard! – that this plandanium dude is actually an honourable ally. “Soundlessly, the Skrull saucer bearing Rom lifts off from the Baxter Building. “Soon, it passes beyond Earth’s atmosphere.